"When I decided I wanted to pursue an additional bachelor’s degree, I wanted a program that would fit into my full-time work schedule. However, I didn’t want the program to sacrifice quality for convenience. Point Park’s location and thorough curriculum were a great fit." Why did you choose Point Park University for your post-baccalaureate degree in accounting? I earned a degree in business management and am employed by Highmark. When I decided I wanted to pursue an additional bachelor’s degree, I wanted a program that would fit into my full-time work schedule. However, I didn’t want the program to sacrifice quality for convenience. Point Park’s location and thorough curriculum were a great fit. Tell us about the work you do for Highmark. 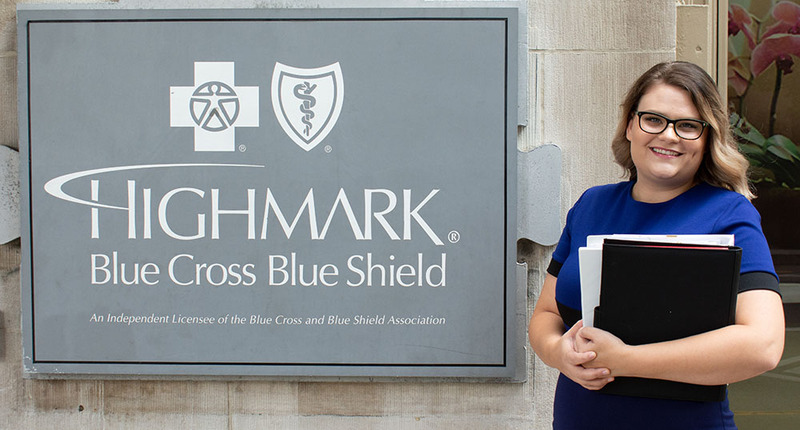 I work in Highmark’s Financial Investigations and Provider Review Department as a member of the vendor team. Our team is responsible for a significant amount of the recoveries received as the result of provider audits. I collaborate with vendors, internal business units and providers to prevent provider abrasion, while also confirming the recoveries returned to Highmark. It isn’t required to have an accounting degree for my role. However, my educational background and knowledge give me a better understanding of the impact our recoveries have on the organization overall. It has also set me up for various pathways within my department and throughout Highmark. Describe the teaching style of Point Park’s faculty. The faculty at Point Park are really devoted to explaining material from every angle and ensuring that students are engaged in what they’re learning. The professors were open to questions and were receptive if it seemed as though a particular method was not working for students. They also encouraged us to learn from the other students in our courses and not just focus on the designated course material. Ultimately, I want to lead teams, either temporary/project-based or more permanent/traditional. Both of my bachelor’s degrees were obtained with the goal of leadership in mind and when I feel the time is appropriate, I will get my MBA.